Google is reportedly thinking about building its own phone, instead of outsourcing the Nexus phones to manufacturers like LG and Huawei, according to The Telegraph. This chart from Statista shows the problem Google would be trying to solve. Right now, Android is the most popular smartphone platform in the world by far, with more than 80% global market share. 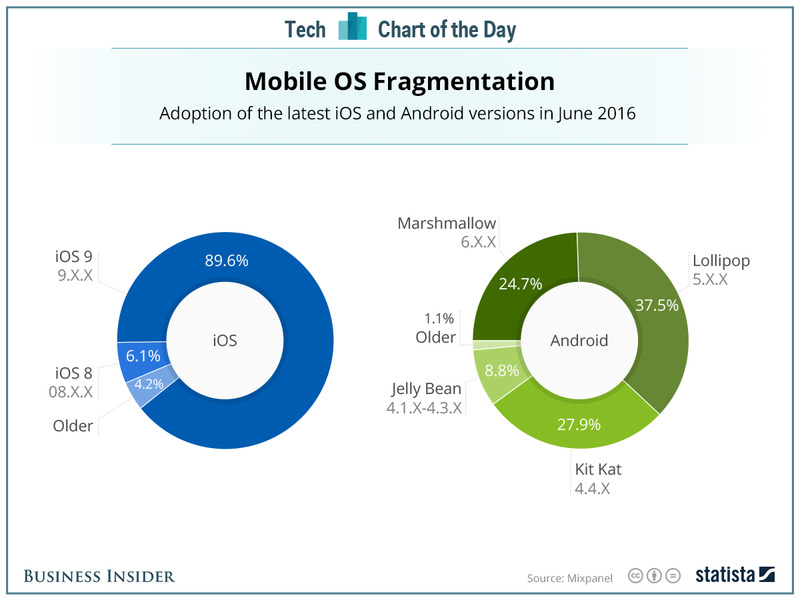 But Android handset makers and carriers often ship old versions of the platform, and seldom update already-shipped phones to the latest release, which means that only 25% of Android phones are on the latest version. (Note that this chart excludes non-Google-approved “forks” of the base Android operating system, which are used by Amazon and many overseas handset makers). Apple exercises much tighter control over the hardware and software, and as a result, nearly 90% of iPhone users are on the latest version of iOS. This means Apple has a much easier time pushing new features to customers, and doesn’t have as much of a burden of supporting old platforms. Building its own phones won’t solve this problem right away — Google will still be competing against every other Android handset maker in the world, and its Nexus phones have never been great sellers. But at least Google can put the laggards on notice and try to push them to the latest features, much as Microsoft has done to PC makers with its Surface line of PCs and tablets.